We use a combination of timeless architectural genius and modern high-performance building materials to create your luxury hideaway. If you are looking for a private space which offers a little more comfort and privacy than the standard conservatory, then an orangery is what you need. From their humble beginnings as citrus fruit growing spaces, orangeries today provide an attractive, luxurious and oasis of peace. Style and grace, creating the perfect relaxing or entertaining space for use all year round. Our stylish range of orangery products features unique external ornamental fascia, fully or part-glazed roof and intricate internal decorations, which help to create a lavish environment. Combining modern design with utilitarian ideas creates an enviable living space you will enjoy for years to come. Your orangery can be a standalone space or be seamless with your home; creating a space that is safe, secure with floods of light for your enjoyment. With a range of orangery styles available to choose from, there is one that will suit your tastes, as well as the style of your home. Imagine all your friends asking you when you are hosting another dinner just so they can come over and enjoy the magnificent atmosphere of your outdoor room. An orangery will bring all this and more to your home, exciting times in the company of friends and family and memories to cherish forever. High-performance glass keeps your room’s environment comfortable. Full or part height windows coupled with fully glazed roof flood your space with light. 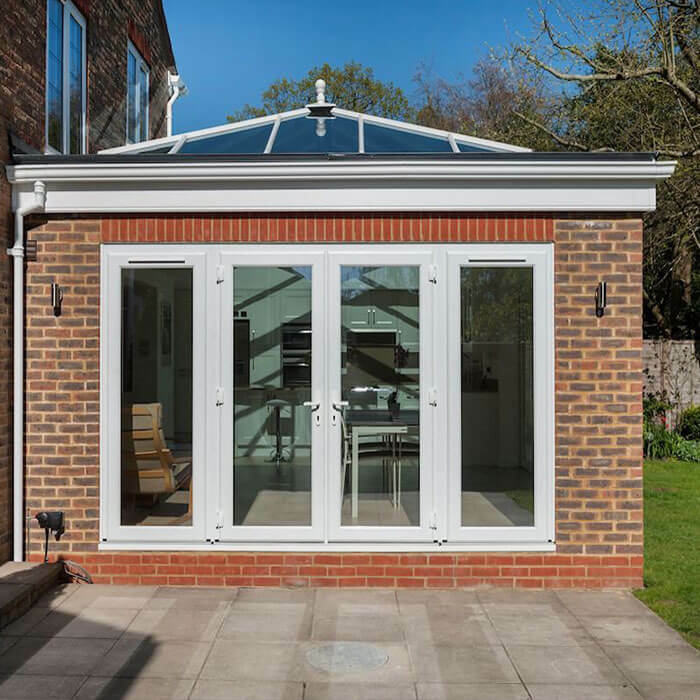 A choice of doors allows you to open up the orangery into the garden to take advantage of warm summer weather. Professional construction and installation ensure you will enjoy your investment for years to come. Our uPVC conservatories are manufactured to the highest quality. Once constructed, they won’t rot, rust, peel or flake, so they need very little care. In fact, a simple wipe down with soapy water every so often is all they need to keep them looking their best. Our beautiful timber conservatories are designed to perfectly complement your home. Tailor-made to your specific requirements, timber exudes an elegance that will be admired and enjoyed by all who see it. 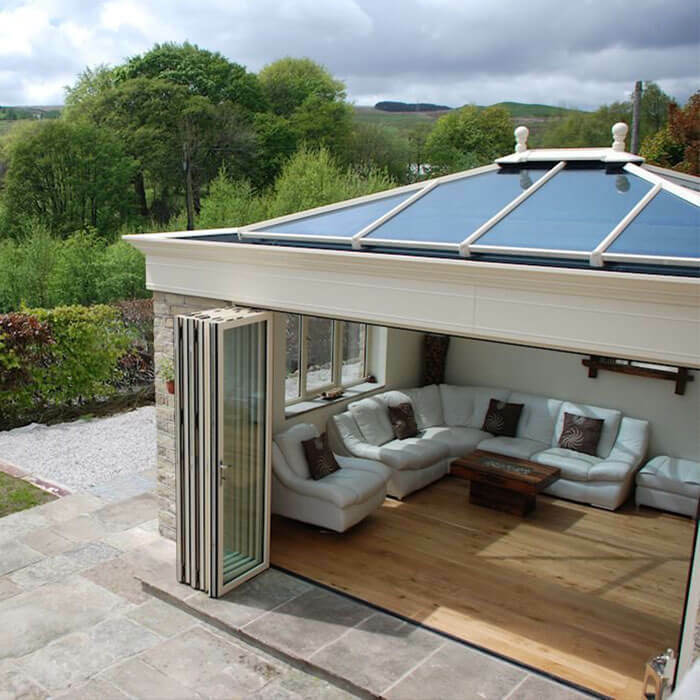 Choosing an Aluminium Conservatory can give your home a feeling of contemporary style. The sleek lines of the aluminium not only let more natural light flood into your new space, it also provides a versatile option that requires very little maintenance. A 21st Century interpretation of traditional orangery designs, Modena’s classical styling pays homage to the very humble beginnings of the orangery as we know it today. Ideal for an open plan living environment that will open up your entire living space. The clean lines and solid shapes of this design suit contemporary architecture and is a perfect addition to any modern house. Enjoy amazing space with the Venetian design. The wide-spanning roof, which is common with this design, is supported by sturdy pillars which allow for a spacious construction. 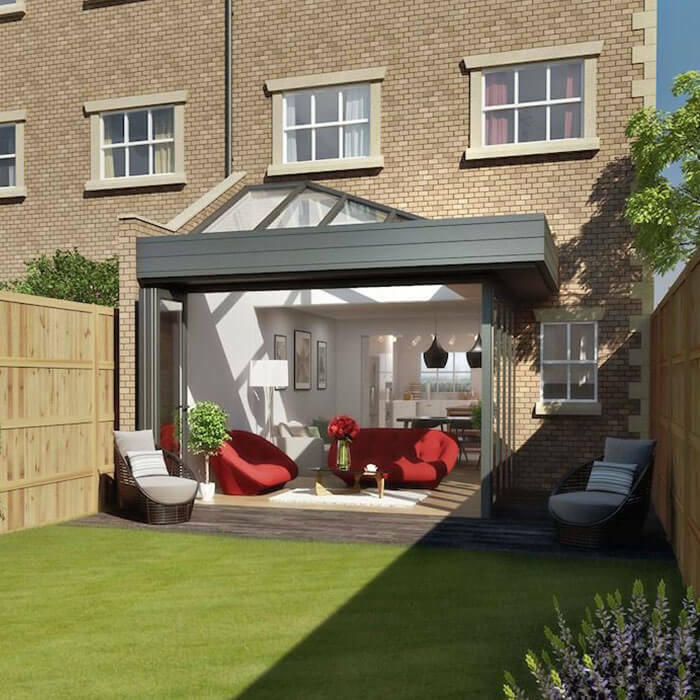 Choose between full-length walls, brickwork to match your existing style or feature bi folding doors to invite the outdoors in. The sweeping glass roof, stretching from end-to-end ensures your orangery becomes the flawless room you can enjoy all year round. Enjoy the sunshine by day and dance under the stars by night. A lantern roof sits atop this classic orangery design, ensuring every inch of your lavish space is bathed in natural light. The popular square profile, with the parapet hiding the roofing rafters, makes Integra a joy to behold from the outside. Internally, you have a roomy space to dress as luxurious as you wish. Enjoy the peace and tranquility of your orangery, whether it’s for your morning coffee or a family dinner. 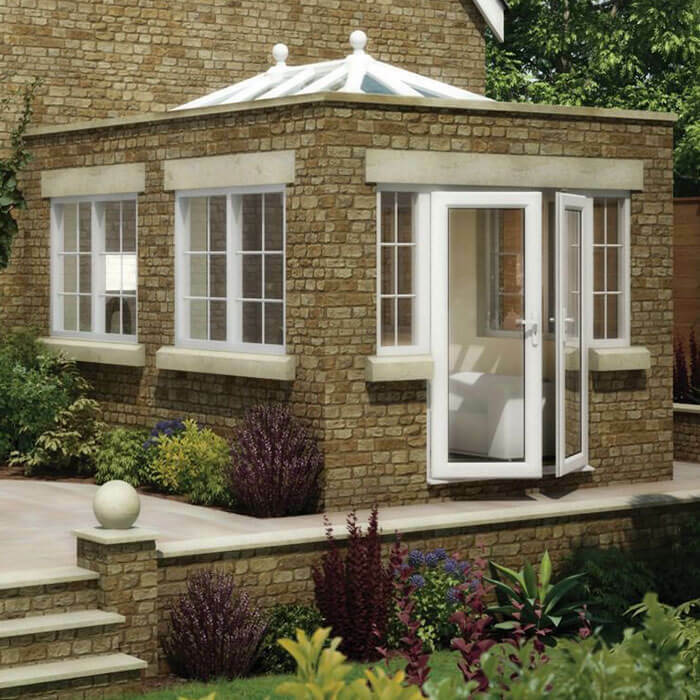 Of all the four orangery styles, Rio adds a touch of elegance to your home. It’s a simple style, prudent in appearance, but don’t let that fool you. The glazed flat roof makes for a great talking point, especially at night when the lit interior is reflected back into the room. Select either, a set of classical French doors or contemporary sliding patio or bifolding doors to open up your home into the garden.